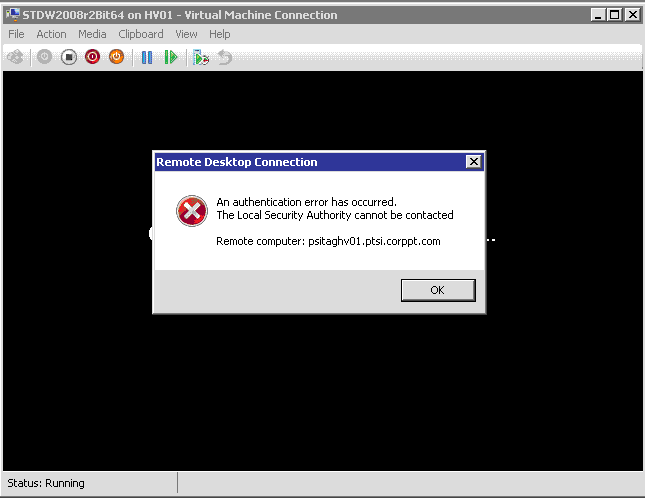 Hyper-V Error: An authentication error has occurred. The Local Security Authority cannot be contacted. “An authentication error has occurred. The Local Security Authority cannot be contacted. This error appear when I was trying to connect to a given Virtual Machine using Hyper-V MMC. The same behavior was true when using Virtual Machine Manager console or Virtual Machine Manager Self-Service Portal. Check your NIC in the Physical Host were you do the management, and additionally also check for name resolution problems with your DCs. Woah, you make my day. I am searching for weeks for this error. Never thought about the Hyper-V physical host. We changed one of our DCs, so an old one was switched off, and the IP of that DC was entered as DNS! Thanks a lot. I am having the same problem but I am unsure how to do what you described. What exactly am I suppose to change? Check you’re using the correct DNS server and no Firewall restrictions are being made between the hosts. Got it! We needed to disable the external NIC on the DC. It worked after that. I got this error when my password expired. After I changed my password things worked again.